All transactions are safe and secure with a reliable history in online purchasing behind each of our associates. 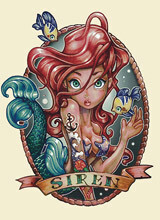 Buy the Ariel Siren t-shirt to own Little Mermaid clothing and merchandise. There is nothing like a faithful sidekick and for Princess Ariel that is her yellow and blue friend Flounder. He goes everywhere with her...aside from on land...for a chance at having some fun. Despite the fact that her adventures often lead them into dangerous situations, he can't help but stick by her. If this relationship is something you often strive for or are already a part of, then grab this tattoo style Ariel and Flounder t-shirt now. To whip up some fun of your own, be sure to check out the variety of Little Mermaid toys and Ariel dolls featured in the gallery that will give you never ending entertainment. In addition to the Ariel Siren tee above, browse the Little Mermaid Clothing Gallery for more apparel like men's and women's clothes, kids shirts or hoodies.